Mission Statement: Seeking to put God’s love into action, Habitat for Humanity brings people together to build homes, communities, and hope. Join us to put your faith into action. We had great support from the Faith Community in Rapid City in 2011 and look forward to another year of service together in 2013. Complete your Group Application to get started! Black Hills Area Habitat for Humanity is a non-profit ecumenical Christian housing ministry inclusive of all faiths and ethnicities. We believe that every man, woman and child should have a simple, decent, affordable place to live in dignity and safety regardless of their race, religious preference, background, or creed. We encourage people of all faiths to work together to eradicate substandard housing. The work of Habitat for Humanity is driven by the desire to give tangible expression to God’s love through the work of eliminating poverty housing. 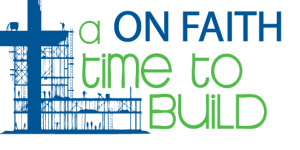 Habitat for Humanity partners with individuals of all faiths, or no faith. Our ministry provides an opportunity for people to put their faith and love into action and to bring diverse groups of people together to build homes and community. Pictured left Pastors Build 2013: Family Heritage Alliance, BigHorn Canyon Community Church, First Church of God, Hillsview Evangelical Free Church, Fountain Springs Community Church and Rapid City Wesleyan Church. View our current Faith Partners.